Methods The genomes of 73 buffaloes of 4 different breeds were sequenced and aligned against the bovine genome, which facilitated the identification of 22 million of sequence variants among the buffalo genomes. Based on frequencies of variants within and among buffalo breeds, and their distribution across the genome, inferred from the bovine genome sequence, 90,000 putative single nucleotide polymorphisms were selected to create an Axiom® Buffalo Genotyping Array 90K. Results This 90K ªSNP-Chipº was tested in several river buffalo populations and found to have *70% high quality and polymorphic SNPs. Of the 90K SNPs about 24K were also found to be polymorphic in swamp buffalo. The SNP chip was used to investigate the structure of buffalo populations, and could distinguish buffalo from different farms. A Genome Wide Association Study identified genomic regions on 5 chromosomes putatively involved in milk production. 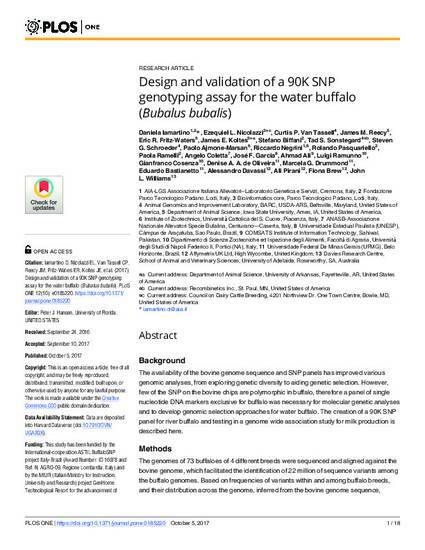 Conclusion The 90K buffalo SNP chip described here is suitable for the analysis of the genomes of river buffalo breeds, and could be used for genetic diversity studies and potentially as a starting point for genome-assisted selection programmes. This SNP Chip could also be used to analyse swamp buffalo, but many loci are not informative and creation of a revised SNP set specific for swamp buffalo would be advised. This article is published as Iamartino D, Nicolazzi EL, Van Tassell CP, Reecy JM, Fritz-Waters ER, Koltes JE, et al. (2017) Design and validation of a 90K SNP genotyping assay for the water buffalo (Bubalus bubalis). PLoS ONE 12(10): e0185220. doi: 10.1371/journal.pone.0185220.